If you cant get into Indigo as often as you would like, you may like to take advantage of our new delivery service. 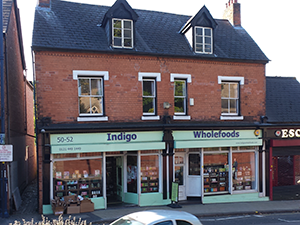 You can have your natural and organic produce delivered to any address within 5 miles of Indigo Wholefoods for a flat £1 delivery charge so long as your order is over £15 in value. The minimum order value is waived if your order includes an organic fruit and vegetable box. To order call 0121 449 1449, tell the salesperson what you would like, when you would like it delivered (we'll do our best to fit you in when you want) and your credit or debit card details to pay. Alternatively, drop into the shop collect your shopping and ask for it to be delivered when you reach the counter. Boxes are received at the shop fresh on a Sunday (approx 2pm) and a Thursday (approx 5pm) and can be delivered on a Monday morning or a Friday morning with our new delivery service. To order drop into the shop or call 0121 449 1449, tell the salesperson when you would like your box and what size you would like. Please say if you would like fruit and vegetables, fruit only, vegetables only, salad only and if there is any produce you would prefer not to receive.